If you have been to the Dentist before for a filling you might be knowing that after the Dental filling or Restoration is done a Blue or Red paper is put between your restored teeth and the Dentist asks you to bite on it. And you are asked if it is too high when you bite down and if he/she feels that it is the filling is trimmed down. The patients sometimes want to get out of the clinic fast and say that it is fine to get on with daily life even if the filling is a bit high which leads to having high point. In case your mouth is numbed you will not have any sensation and to find out if the filling is actually high or not becomes difficult, so in these cases the filling is higher that the rest of the teeth and comes in contact before the other teeth putting more force on this particular tooth. This is one of the main reasons for having pain after getting a filling or restoration. 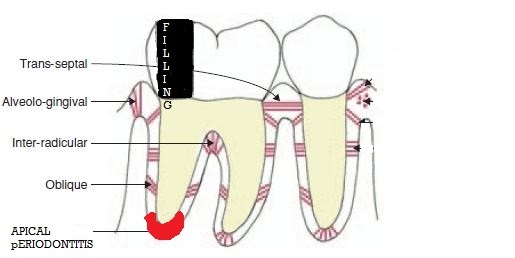 Why a high filling leads to pain ? If you look at the Anatomy of the tooth inside the bone we can make out that the Root part of the tooth which is in Bone has a layer of tissue separating the Bone and tooth called the Periodontal Ligament. And as this is a soft tissue when there is a high point or high filling excess pressure id exerted onto the tooth and the periodontal ligament is pressed down. This leads to inflammation of the Periodontal ligament in that particular area of the Root which is can be seen in an IOPA Xray as well. This condition is usually called as Acute Apical periodontitis which is reversible or also called as Symptomatic Apical Periodontitis because it is caused by a Symptom which is High filling and it can be reversed after removal of the cause. What should you do if you feel the filling is too high after returning from the Dentist ? This is the main problem many face after coming back from the dentist and after the effect of the Local Anaesthesia wears off you realise that the filling is high and pain starts slowly. If you are feeling that the filling is high and are having pain on biting or chewing on anything you have a high filling. What will the Dentist do to stop the pain of Acute Apical Periodontitis or Symptomatic Apical Periodontitis ? As mentioned above this is caused due to a high filling and it is a reversible condition. When you go back to the Dentist, a blue or red piece of paper is placed on your tooth and you have to bite down on the paper and do some lateral movements. Now the dentist will trim or grind down on the excess filling and you will be asked by the Dentist if you can feel anything high while biting down or chewing down. 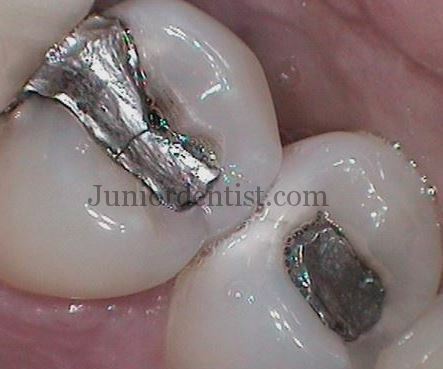 When will the pain subside after a High Filling / Restoration ? After you have revisited your dentist and got the filling trimmed there will be immediate relief in some cases and in some other cases it will take some time which can range anywhere from 3 days to 10 days. So just wait for some days and you should not bite on any hard foods with the affected tooth and keep to soft food to help the tooth or the periodontal ligament heal by itself. And if the pain is not subsiding even after the soft diet and after 10 days you have to immediately visit your dentist and make sure that there is not other problem which might be causing the pain. i also have pain in my tooth after getting session of filling ! Gosh, it must be so painful. I saw the picture of the fillings and just felt I needed to comment, when I was younger, I had similar fillings in two of my molars. It feels very natural until you run your tongue over them and realize that if feels cold and metallic, it also feels a little weird when your fork makes contact with it, but that is just about it, they are awesome. I had a severe pain in my back tooth and searched for natural ways of getting rid of it but didn’t help me until i decided to see a dentist. Then through Dentzz Review I came across this video where a patient from Australia shares his experience and opted to go here and its worth it. Not only has my pain subsided but also face a very little pain after the treatments so far. Could you tell me how many mm counts as “high filling”? I think I have an approximately 0.2 mm higher filling (the edge of the filling goes 0.2 mm above my normal tooth surface approximately by looking at and feeling it). Is that still within the tolerable threshold? Will that amount naturally erode down as I eat and grind my teeth? Even 0.1 mm can be very uncomfortable and lead to Trauma from occlusion if left unattended when you start feeling a high point of discomfort while chewing or when you close your mouth or occlude your teeth.